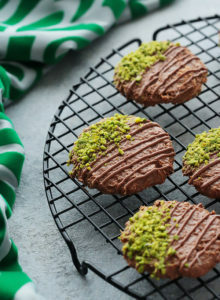 A Middle Eastern spin on an ice cream favorite! 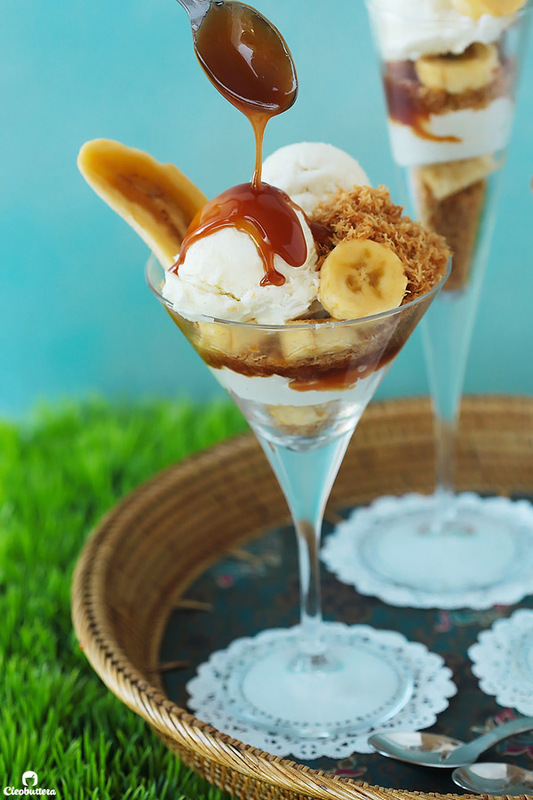 Vanilla ice cream layered with bananas, warm salted caramel sauce and caramelized cinnamon kunafa crumbs for crunch..Heavenly! 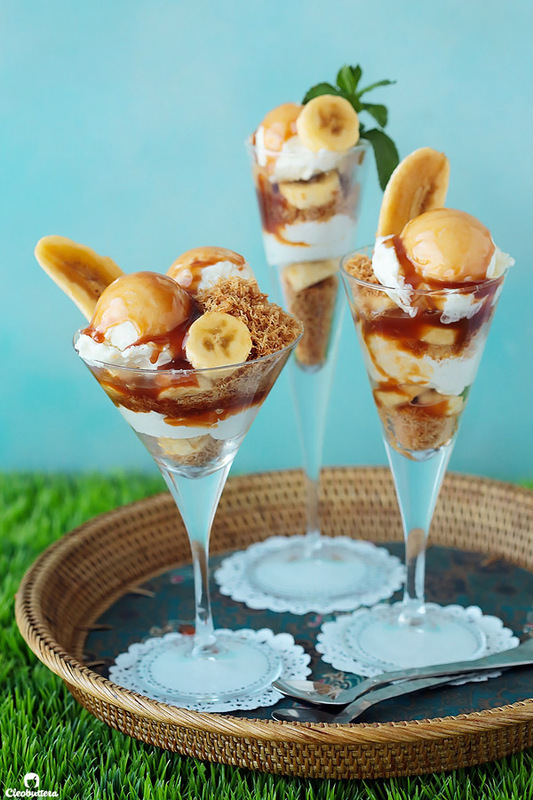 It’s no secret that my family has long been my lab rat for my Middle Eastern fusion madness, but never, and I mean never, have I ever had a reaction from them as enjoyable and joyous as when I made this Banana Caramel Kunafa Sundae this Ramadan season. The S’mores Kunafa Pie was a huge hit and had chocolate lovers’ tastebuds banging up the roof, but this…this was a different story. Literally everyone, young or old, with or without intention, slipped out either an ooooohhh or an aaaahhh or Mmmmmmmm while eating it. Everyone. Vanilla ice cream...who doesn’t love that? 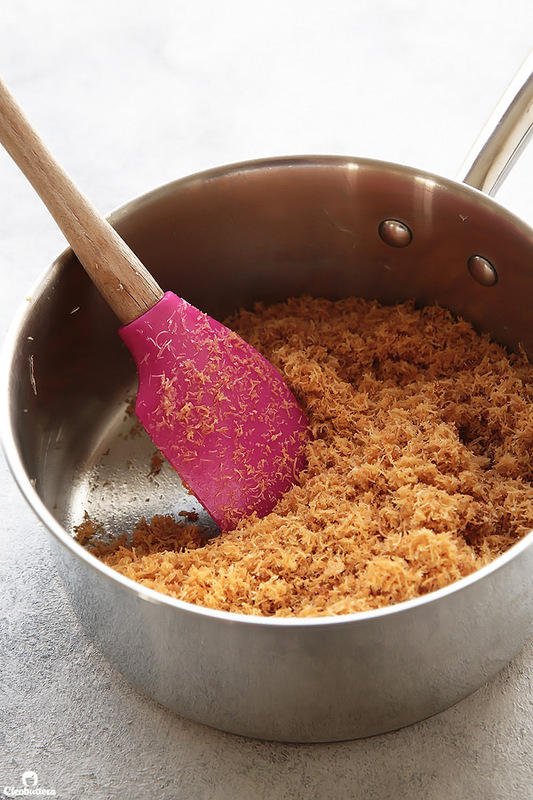 Caramelized cinnamon kunafa crumbs…hellooooo mega crunch and bomb flavor! We all know that banana, caramel and ice cream are a dynamite trio, but add to that the delightful crunch of kunafa with a hint of cinnamon and you’ve got heaven in a cup. It always feels like a triumph when a recipe that is so simple to throw together turns out a BIG hit! Recipes like these are not easy to come by and are treasured when they do. 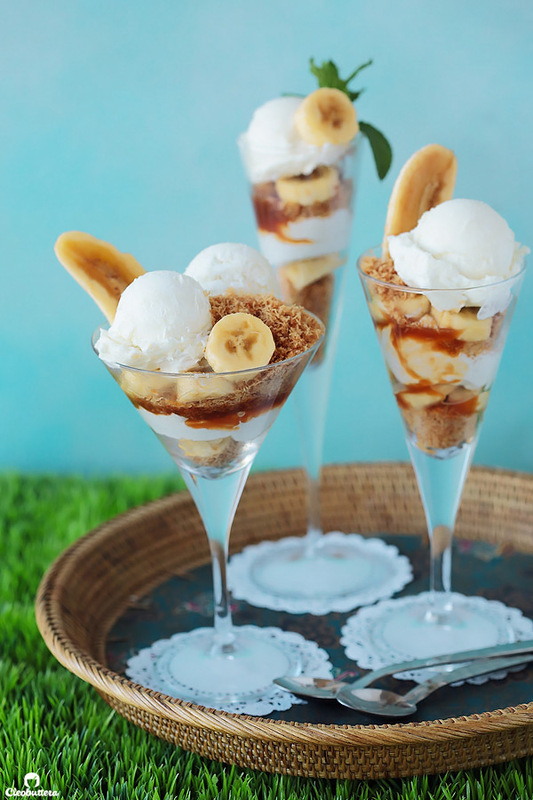 The idea for this ice cream sundae came to me when I wanted to create an easier, less involved version of the Cone-afa Ice Cream. That thing is great and all, and one of my all-time favorite creations EVER, but truth be told, it does require some crafting skills, a special type of fresh kunafa that can be hard to find, and a pinch of patience. This one though…requires empty tummies. 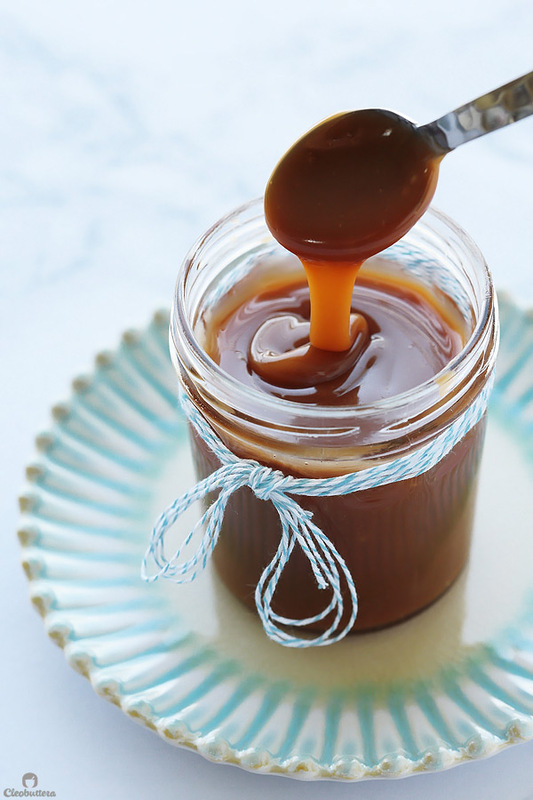 Salted Caramel Sauce…well you could take a shortcut and use store-bought, but nothing beats homemade, especially when it only takes 10 minutes of your time. 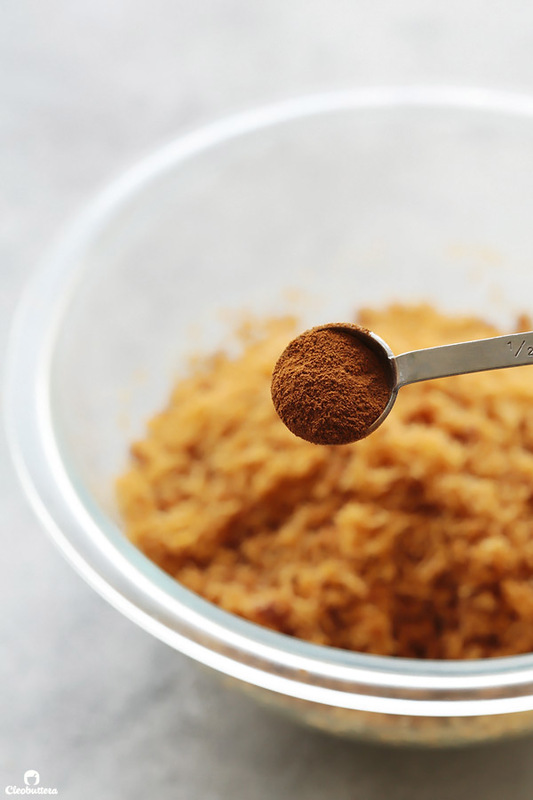 As for the caramelized cinnamon kunafa crumbs…easy peasy. Take a look! Till it has gorgeously toasted and wafting with buttery, caramelized aromas. The reason why I add the sugar during the cooking process and not after (which is the norm), is that I love how the sugar melts and coats the kunafa shreds with caramelization. This gives the kunafa even more crunch, longer shelf life and extra special flavor. Speaking of special flavors…cinnamon in kunafa is my new favorite thing. AMAZING! 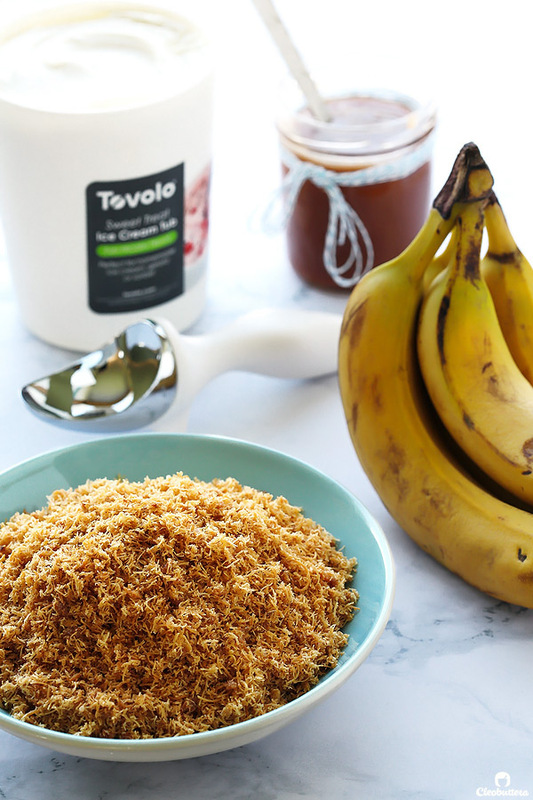 Only 1/2 teaspoon takes it from delicious to ridiculous, and goes really well with caramel and banana. After that, it’s all a matter of assembly! Put out all the components and let your guests have fun with it, or do it for them and watch them drool. Layer in the kunafa, followed by banana slices, then ice cream and sauce…repeat. Make this one folks. You will not regret it! Or maybe you will when you step on the scale the next morning…but let’s not get into this. It’s delish and worth every calorie. And oooooh….it has bananas!!!! Potassium people! We all need our potassium. 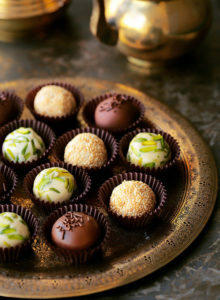 A Middle Eastern spin on a ice cream favorite! 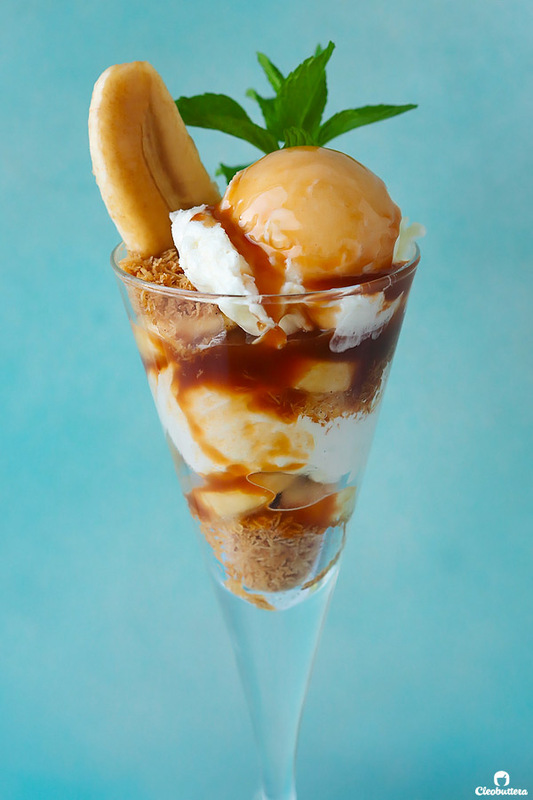 Vanilla ice cream layered with bananas, salted caramel sauce and caramelized cinnamon kunafa crumbs for crunch..Heavenly! While the kunafa is still semi-frozen, break it between your hands to crumble into small pieces. Kunafa shreds easiest when semi-frozen. In a large pan (the larger the better) over medium heat, melt the butter. Add in the sugar and stir until it starts to dissolve; about 30 seconds. Add in the shredded kunafa and stir well until evenly coated with the butter and sugar. It will be difficult to stir at first, but will loosen up as the kunafa starts to toast. Continue stirring constantly, being careful not to get any burn marks, until the kunafa is evenly golden brown in color and is very crunchy; about 10 minutes. Add in the cinnamon and stir to combine. Transfer the kunafa crumbs to a bowl and allow to cool completely before using. Cooled caramelized kunafa will keep well, covered tightly with plastic wrap for about a week. Meanwhile, make the salted caramel sauce. Gather all your ingredients and keep them nearby for immediate use. Bring sugar and water to a boil in medium heavy-bottomed saucepan over medium-high heat. Cover the saucepan for about 1 minute; the condensation will wash down any sugar crystals that might've gathered on the sides, which will reduce the chance of crystallization. Cook, without stirring, swirling saucepan and brushing the sides of the pan occasionally with water, until mixture is amber-colored. 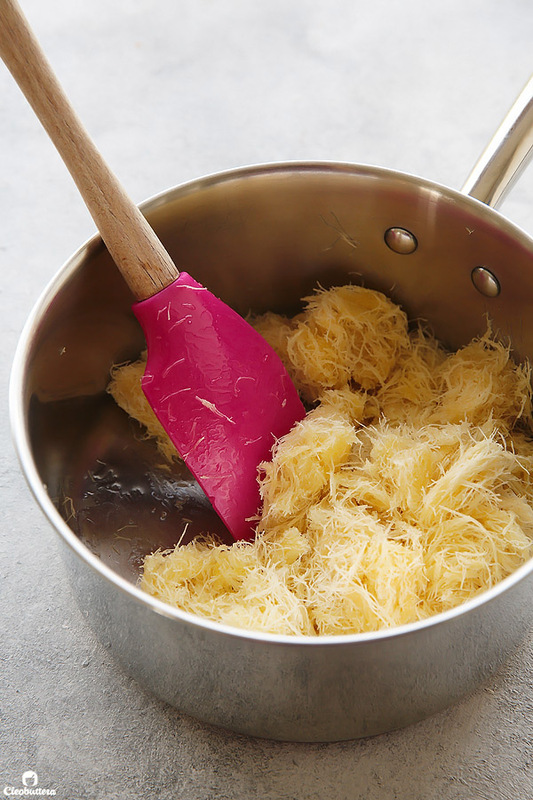 Remove the saucepan from the heat and immediately whisk in the butter until melted. Carefully pour in the cream; it will bubble vigorously, then whisk well to combine. Return the saucepan to heat and continue to whisk until the mixture is completely smooth and hard caramel clumps have dissolved. Stir in the salt. Transfer caramel to a serving vessel. Use while still warm, or reheat in the microwave before using to warm through. 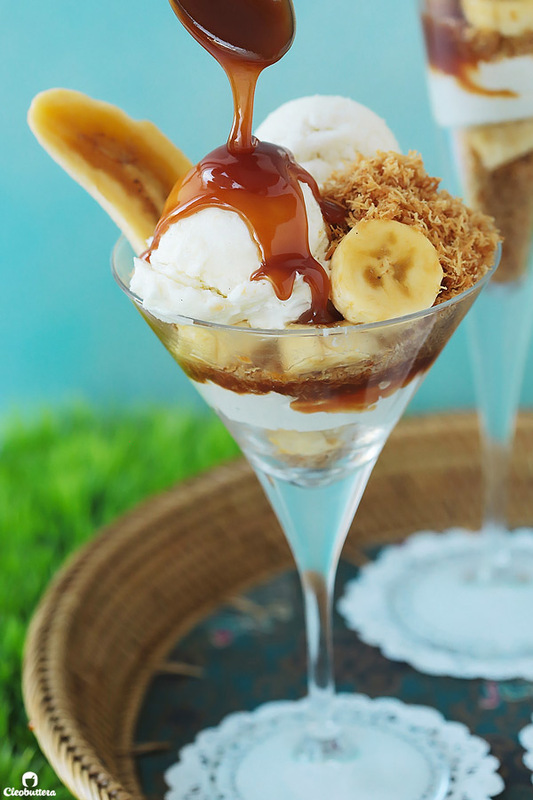 In serving glasses, spoon a layer of kunafa crumbs into the bottom, top with banana slices, then a scoop of ice cream and a drizzle of the warm caramel sauce. Repeat with another layer on top of this, if desired. Serve immediately. Salted Caramel Sauce recipe adapted from Cooking Classy. Thank you so much Kanchan! I’m really happy you like it. Unfortunately I have no idea what sevaiya, so I won’t be able to give you a confident answer. I googled it though & while it does look similar, I’m concerned that the texture might be more noodle-like then pastry. So sorry for not being able to help. 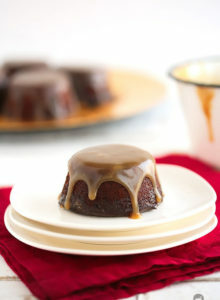 Thank you for this and for all your recipes.I have been on the lookout for a good caramel sauce recipe for a long time and will definitely try this one. You make cooking easy ,exciting and so much fun with all your tips and humorous comments .And finally let me end by saying that ,I have tried your’ kunafa with cream’ recipe a number of times and it has always turned out fabulous.Thank you once again and have a great day!